One Hot Lap: Subaru Has Announced a Switch to 1-Wheel-Drive Cars! Emboldened by its success with reducing the number of drive wheels per car, Subaru has announced a major move to 1-wheel-drive models in 2013. 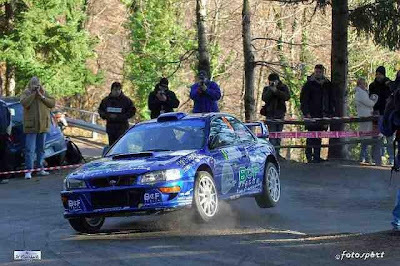 They will start by re-introducing the hugely successful Subaru Impreza WRC as a 1-wheel-drive model (pictured above as a thinly disguised test mule.) Subaru expects the new 1-wheel drivetrain to shed additional 200 lbs of weight, which can be strategically relocated for better traction over the one wheel driving the car. Subaru is hopeful the 1-wheel drive models will catch on with consumers and is already developing a unicycle prototype that they hope to sell to consumers living in states enforcing death without dignity laws.